Dog Tales is made up of a select group of experienced professionals who are also lifelong animal lovers and pet guardians. We understand that your pet is a valued member of your family and deserves the highest level of care and treatment. As a result, DogTales is committed to providing superior service to both pets and their guardians, utilizing positive, reward-based techniques in all that we do. I first fell in love with animals as a girl growing up in Maine, and while I've worked successfully in many fields, I always thought something was missing. It wasn't until I was rescued by my dog Tucker, who was found in a trash can, that I began to realize that my lifelong passion for animals could also become my livelihood. As a result, I founded Dog Tales in October of 2002 to offer personalized services to fulfill the needs of pets and their guardians. From private walks to play groups for dogs, and in-home pet sitting for dogs and cats, pets receive love and attention in a safe and caring environment. DogTales is a fully licensed, bonded, and insured San Francisco business. Dog Tales is a proud member of The Pet Professional Guild, an organization devoted to pet industry businesses who in their words, have a mutual “goal of furthering the public’s education and awareness of force-free dog training and pet care methods, techniques and state of research in dog training and pet care and to promote the common interest of spreading ‘force-free’ dog training and pet care methods to the pet industry. I am a graduate of dogTEC's exclusive program, where I was certified as a professional dog walker. 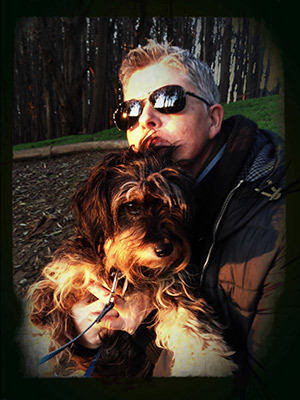 I am also a member of SF Dog, San Francisco Professional Dog Walkers Association and the Association of Pet Dog Trainers. I am certified by both the American Red Cross and Pet Tech in Pet First Aid and CPR. 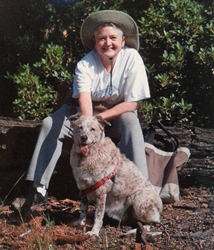 In addition, I am a graduate of the Canine Instructor Training Academy offered through the Marin Humane Society and taught by behaviorist Trish King. 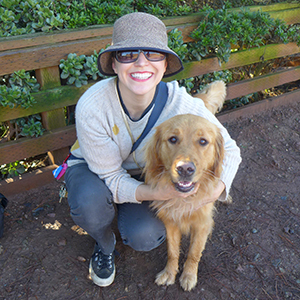 I continually update my knowledge of companion animal behavior by participating in workshops, seminars and readings. Click here to see a list of selected Conferences, Seminars and Workshops that I have attended. I've been fortunate enough to live in San Francisco for over 40 years now and have been working with Dog Tales since 2007. In all but the first two years in SF I've had the delightful task of sharing my life with some marvelous dogs. First there was San Andreas, a Lab mix, then Wellington, a pure breed Lab whose grandfather was the legendary "Ballpark Frank", 6 times consecutive national field champion, and finally a beautiful Australian Shepherd named Brownie who lived with me and Wellington for 17 years. So I have been around dogs for a long time and have loved every minute of it. Because of all of the above I have know Deborah for a long time as we have had frequent long conversations in the dog park. Looking forward to meeting you on the dog trails all over this glorious city. I am certified by Pet Tech in Pet First Aid and CPR. I've been with Dog Tales since 2013, but have been working professionally with pets (through my own business or other's) since 2009. I am certified in Pet First Aid and am a graduate of Dog Tec's Dog Walking Academy. I have assisted puppy classes and a clicker class with Fawne Pierre of Smarty Pup!, and assisted classes for DogEvolve including Leash Monster classes for barrier aggression, No Barking classes, and Recall classes. My group is a great balance of mellow dogs and playful dogs. They are all super snuggly and I always give them a lot of affection. I have always loved, and lived with, dogs. Throughout my childhood, I would cut out random pictures of dogs from newspapers and magazines to save in a “dog scrapbook.” My last two dogs lived to the ages of 16 and 14, including many age-related ailments that required special care. For this reason I have a special interest in caring for our older canine companions, where I can bring extra sensitivities to their needs. Now retired after 33 years as a high school English teacher, I want to spend more time with the animals I love. I’m available for individual dog walks, home visits, and cat sitting.